Legal news for Connecticut SUV rollover attorneys—Connecticut police reported to an SUV rollover accident where emergency medical services treated one for injuries. Wallingford, CT (NewYorkInjuryNews.com) – Connecticut police officials rushed to the scene where a sport utility vehicle (SUV) rolled over on Route 150, Thursday, December 3, 2009, according to The Record-Journal. The morning crash temporarily closed down Route 150 causing fire officials to shut down Woodhouse Avenue at Bridle Lane on Thursday. Police did not report what caused the SUV to rollover. There were several passengers in the vehicle at the time of the crash. The names and ages of the victims were not released. Emergency medical services (EMS) arrived on the scene to transport the injured. One of the victims was transported to a local hospital to be evaluated and treated by doctors and nurses. He reportedly suffered from non-life threatening injuries. Local police authorities and fire rescue officials remained on the scene for an hour afterward to investigate the rollover crash. Police reported that the accident was not being treated as a serious wreck. The crash site and the time of day made the rollover seem worse than it was. It was not reported if alcohol or drugs were a factor in the crash. 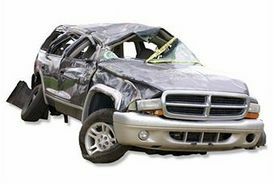 SUV rollover accidents can be caused by a number of reasons other than human error. According to the National Highway Traffic Safety Administration (NHTSA) www.NHTSA.gov SUV’s have a 14 to 23 percent rollover rate, which is greater than other passenger vehicles. SUV’s also have a higher fatality rate than most vehicles.